I’ve been drawn to Sapa for some time. Alluring photographs of shimmering green rice paddies wrapped around the foot of majestic mountains were more than enough to put trekking the landscape on my bucket list. Having recently started a job in an international school in Bangkok, my proximity to Vietnam, along with yet another school holiday, made it finally possible this month. I found myself in Vietnam during the hectic Tet holiday. This seemed like opportune timing to visit Sapa, because I could enjoy Hanoi for a few days and then quickly escape the crowds and mayhem and head to the mountains. I booked a 3 day/2 night trekking tour with Lily’s Travel agency. 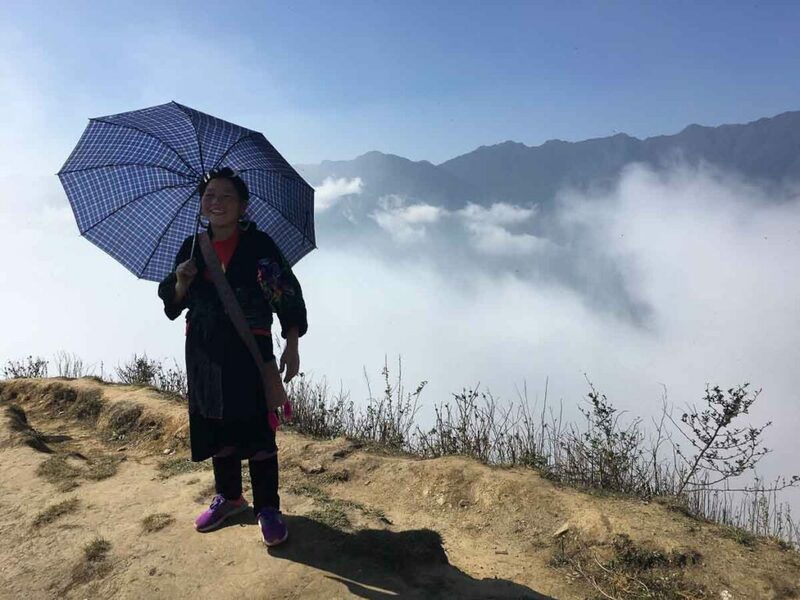 The trek was with Mao and her sisters who live in the various villages around Sapa. I had been cautioned that as it’s February, the rice paddies wouldn’t be as dazzling as a google search would have me believe, but I needn’t have worried for a second. It was spectacular. The best thing about booking my Sapa trek through Lily’s is that they took all of the stress out of the process and did all of the organising for me, without sacrificing uniqueness or adventure. It was clear from the start that they are absolute professionals. They planned the whole trip for me efficiently and executed it expertly. They didn’t even seem to mind exchanging endless emails about ideas, dates, changes of dates, changes of trips and answering any number of questions I threw at them. I dealt with Duong throughout and he even gave me his phone number so we could keep in touch via Whatsapp throughout. It was reassuring to be in such capable hands, especially when travelling solo. I took a sleeper bus to Sapa town from Hanoi. It left at 9.30pm and I was surprised at how comfortable it was. I managed to sleep the whole way and arrived bright and early in Sapa on Saturday morning. It was my favourite kind of morning, chilly with the promise of a beautiful blue sky and sun peeking out from behind the clouds. Mao was waiting for me as I clambered off the bus and I instantly fell in love with her charm and contagious laughter. She was energetic and full of enthusiasm. We went to a restaurant to meet our fellow trekkers, drink some coffee and have a hearty breakfast. Originally, I was a bit wary about the size of the tour group; I’m not usually one for guided tours. But, as I was travelling alone, I decided to give it a go this time. I couldn’t believe our group was only made up of 5 people. Mao’s husband took our big bags to the first homestay in his car so we didn’t have to carry them and then introduced us to Zee, our guide for the trip and off we went! Zee asked everyone in the group which level of difficulty we wanted for the days trekking and told us she could adjust the days depending on people’s preferences. I was glad when everyone chose the longer, more challenging trek and couldn’t wait to get started. We started the trek at about 9 am and I was so excited to get out in the mountains that I was practically running up the first incline. Zee was the perfect guide – she chatted to all of us about local life and traditions in Sapa and even about the trees and plants indigenous to the area. Zee told us what to expect over the next few days and answered all of our questions with genuine enthusiasm. We spent the first hour or so trekking up into the mountains. When we reached the top of the first big incline we turned around and enjoyed the view properly for the first time. I was in paradise. Mountains surrounded us from all angles, making me feel small and humbled as I always do in the mountains. The clear, fresh air was a welcome relief from the smog of Hanoi and I felt truly honoured to be there. We continued walking through the mountains for the next few hours. I was pleasantly surprised not to bump into many other tourists at all. It definitely was off the beaten track and not your usual package tour hiking experience. By lunchtime, everyone was ravenous and were happy to find an adorably simple little restaurant serving delicious rice and noodles. We ate and shared stories of travels from the various parts of the world we were from and filled up with water for the afternoons trekking. The second part of our day was slower, quieter and even more beautiful. We could hear cowbells ringing cheerfully and the gushing of far-away waterfalls trickling down the mountain. We were wandering around above the world, with the clouds below us. Mist hugged the mountains and gave the whole scene an otherworldly feeling. The fresh air gave us energy for the descent into the valley to get to our first homestay, in a place known only to us as ‘village 4’. The homestay took me by surprise. We walked through the village past families going about their day-to-day lives and then we kept on walking, further and further away from the village. We finally walked down a narrow dusty path and rounded the corner. It was worth the wait. The views were absolutely stunning. The homestay was a huge wooden house facing out to the mountains. It was in the middle of absolutely nowhere. It was perfect. We had a few free hours before dinner so we checked out our rooms – which were another pleasant surprise. I had a room to myself with a big comfortable double bed and there were hot showers! They even provided towels, shampoo and shower gel… I was seriously impressed. Not at all what I was expecting. Zee and her sisters cooked us the most delicious feast for dinner. They had a huge fire in the kitchen that they used to cook meat and there was more than enough to go around. There were spring rolls, pork, chicken, noodles, lots of fresh vegetables and what seemed like endless rice, which Zee continually topped up our bowls with. Even when you said, “no more rice, please!” another pile would end up in your bowl. When she finally gave up and we were all completely full, out came the ‘happy water’ – local rice wine, which was replenished almost as heartily as the rice. After a few drinks, the term ‘happy water’ made complete sense! We had a lovely evening getting to know each other, sitting outside appreciating the clear night sky and the endless stars. It was one of those perfect moments in life and everyone felt special and lucky to be a part of it. Sleep came easily after our tiring day and we woke leisurely to the smell of fresh coffee, pancakes and eggs. We started the day with Zee asking us what we wanted from the days trekking. We were given the option of doing some walks around the area and staying at this homestay again for another night or trekking to another village. We decided to trek to the new village and I’m glad we did! We started off walking above the clouds again but soon found ourselves walking down into the empty terraces and the fog hanging around them gave them a mysterious, enchanting feel. It was windy and we put our coats on and embraced the wind blowing our hair around our faces and I loved feeling so connected to nature. We trekked along the rice paddies into a village and had delicious pork pho for lunch. The soup warmed us up and energised us ready for the rest of the afternoon’s trekking. As we walked further and further into the valley, the sun came out and revealed to us the spectacular mountains, which were previously hidden by fog. Before too long we were descending into the valley and were at our second homestay, in ‘village 6’, right next to the river. It was great to experience a night at the bottom of the valley. Our hosts were a lovely couple who made sure we had fresh towels and everything we needed to be comfortable for our stay. It was only three of us at this point so we had the whole homestay to ourselves! We spent a few free hours exploring the local village. We found our way down to the river to watch the sunset with our feet in the water, enjoying a few beers. It was another perfect moment watching life roll on in front of us in this place in the middle of nowhere. We had another impressive feast for dinner with endless meats, vegetables and sticky rice this time. Our hosts seemed so pleased that we enjoyed the food and joined us for a few more rounds of ‘happy water’. It was a real bonding experience and we really felt part of their family for the evening. We woke in the morning feeling sad that the trip was coming to an end. I sincerely felt I had spent 3 days in paradise and I didn’t want to leave Sapa. I could have easily stayed for another week. We decided to spend our last few hours walking to a nearby waterfall. I wasn’t expecting another slice of paradise awaiting us! We walked through a small forest and peaked our heads out of the bushes and saw a huge waterfall gushing with water into a beautiful pool of inviting blue water, glistening in the sunlight. There were enormous boulders covering the path so we had to scramble over them to find our way to the water. We all stripped off and jumped into the icy cold waters. It was shockingly refreshing and definitely woke us up! We swam in the water and made the most of our beautiful surroundings. We lay in the sun to dry off and reminisced about out 3-day slice of perfection. It was time to leave. As always, when travelling, moving on and saying goodbye to people and places with which you share a deep connection is difficult but special in its own way. We collected our bags, got picked up and driven back to Sapa town. I was more than ready to sit back, take in the impressive views one last time and reflect on a genuinely authentic, rugged and beautiful experience trekking in Sapa. It exceeded all my expectations, and they were high! I’ve recommended it to all of my friends and I hope to return again myself one day. If you’d like to book an amazing Sapa trekking and homestay experience like this, then get in touch with us today and we’ll plan your perfect trip!